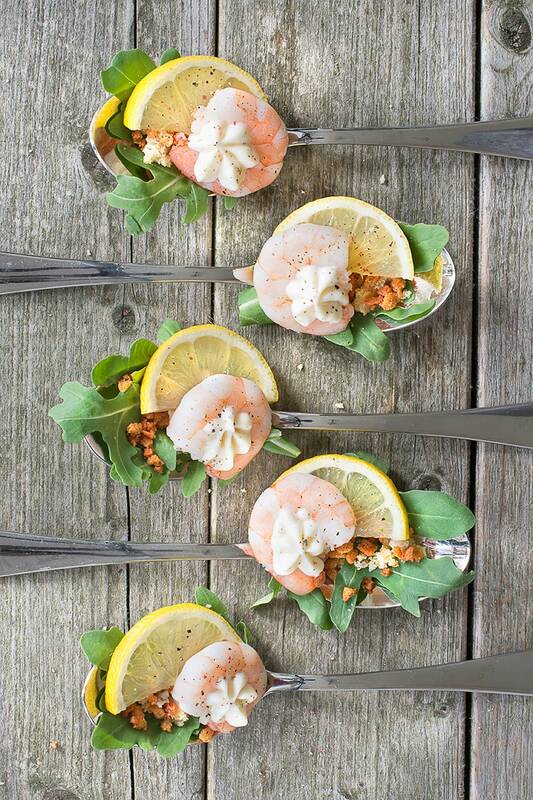 Fresh king prawns with rocket, croutons, bacon, lemon and mayonnaise, all served on a single spoon – perfect for a party. 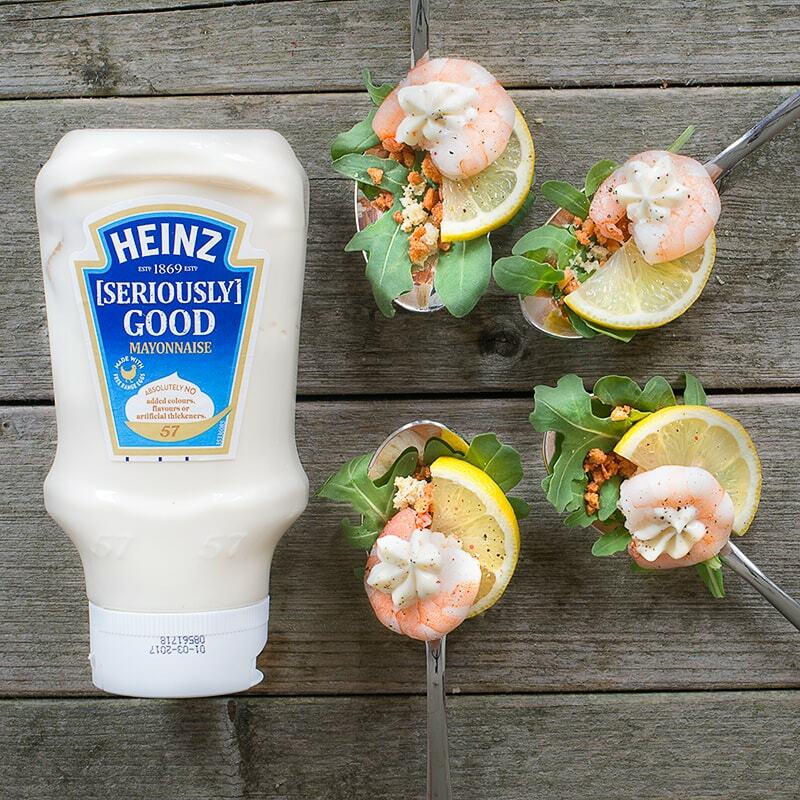 As you know, I love a good recipe challenge and so couldn’t resist when Heinz invited me to create a new recipe to celebrate the launch of their new [Seriously] Good Mayonnaise. There was however a twist to this challenge… it had to fit on a spoon. My immediate thought was to rush out and buy a giant spoon but apparently that’s cheating so I had to think of something dainty. I immediately started listing out all of the foods I think taste even better smothered mayo and once I’d thought of prawns I stopped. 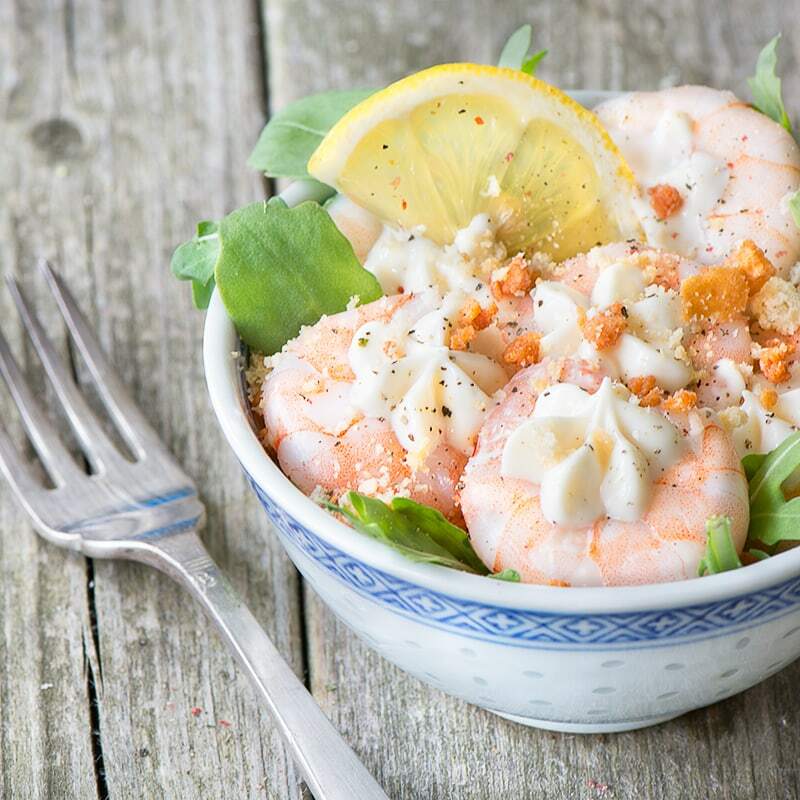 I remember once being on holiday with a big bag of cooked prawns and a tub of mayo and just eating the prawns dipped in mayo for lunch in the sunshine (oh so yummy!). 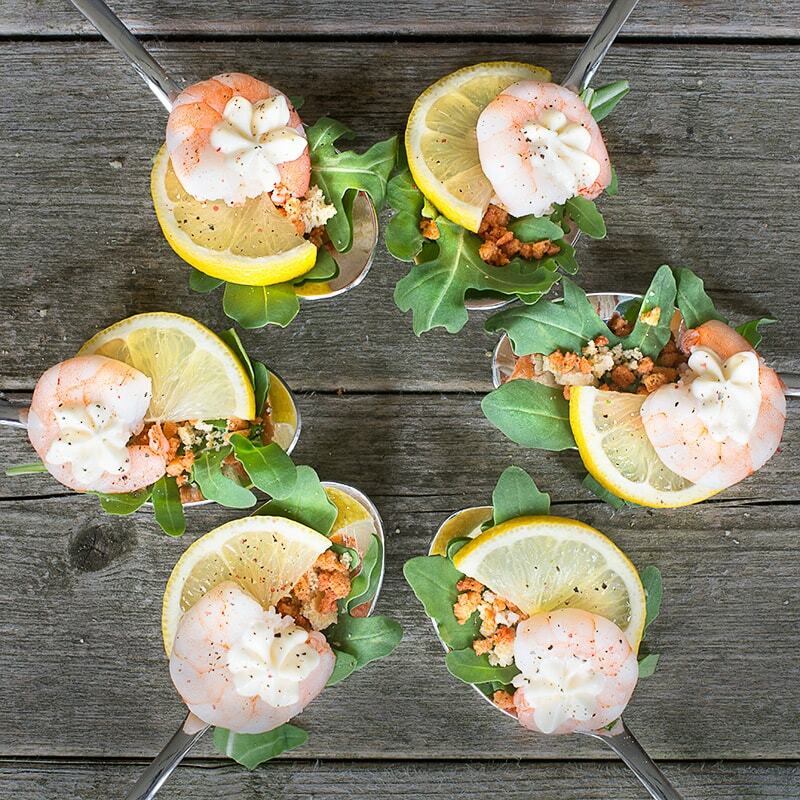 As delicious as it is to serve up a prawn with a dollop of mayo on it, I thought this recipe should be a touch fancier so I decided to create my own version of the 70’s classic – the prawn cocktail. I then proceeded to raid my cupboards of all the things that go brilliantly with prawns and created my prawn cocktail spoons, with rocket (adds some pepperiness and looks pretty on the spoon), croutons (for some crunch), crispy bacon bits, a little lemon and of course the prawn and some [seriously] good mayonnaise. I accept that this may not be the most traditional set of ingredients for a prawn cocktail (certainly the ones from my childhood only consisted of prawns, pink sauce and iceberg lettuce) but trust me they really work together – you’ll definitely be grabbing more spoons to try once you’ve had one! 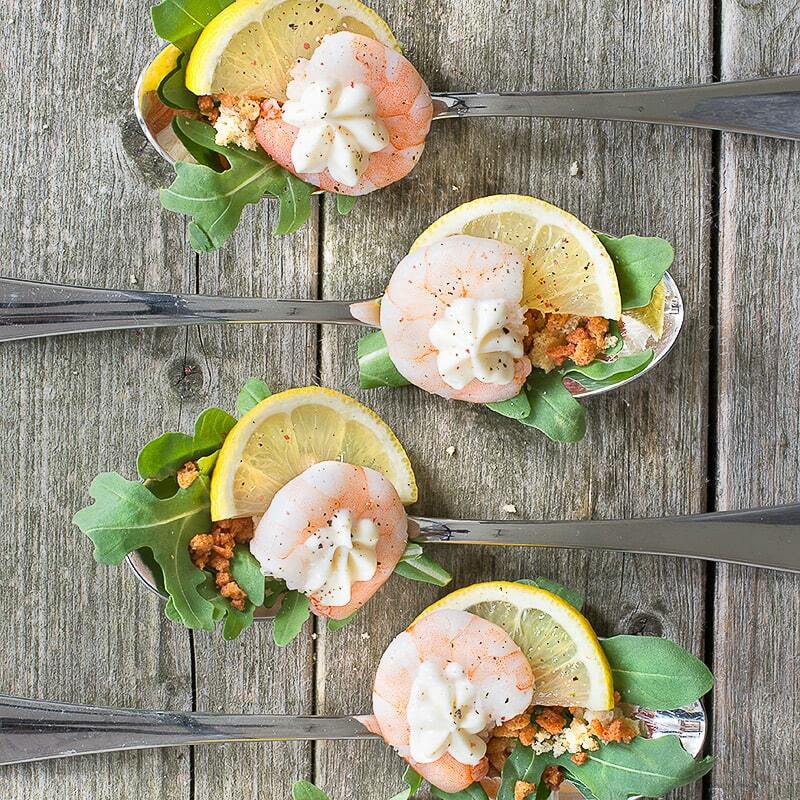 These spoons make a lovely canapé for a party or if you prefer you can always put everything together in a larger bowl to make a delicious salad or starter instead. Have you got what it takes to create a [seriously] good spoonful? To celebrate the launch of their new mayonnaise Heinz have embarked on a nationwide search for the best [seriously] good spoonful. 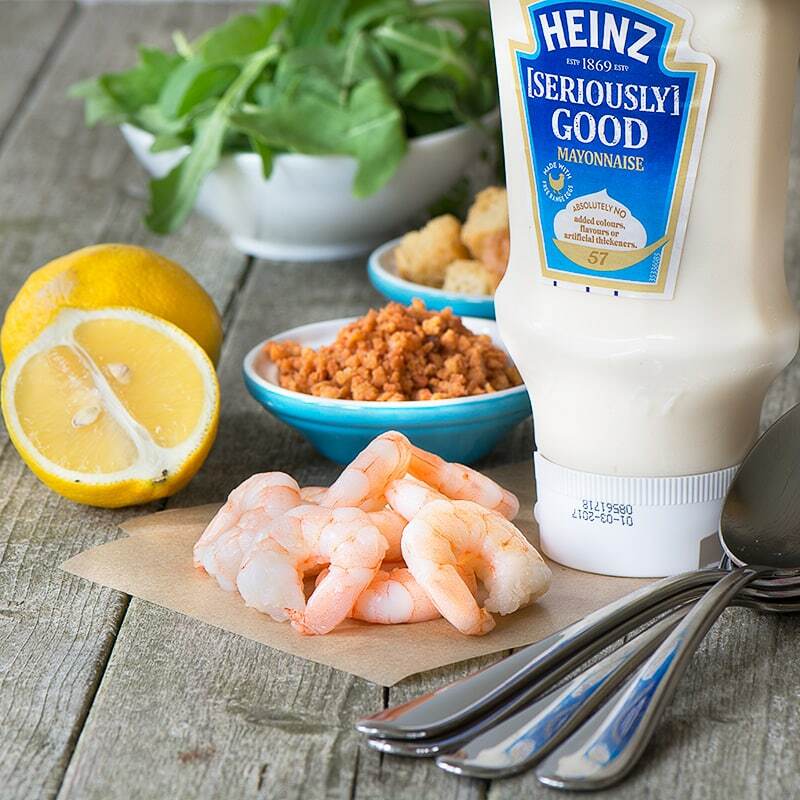 To enter all you need to do is create your own yummy spoonful featuring Heinz [seriously] good mayonnaise and share your creation on social media. Lay a couple of rocket leaves flat on your spoon. Crush your crouton (either using a pestle and mortar, or by putting it into a plastic bag, covering with a tea towel and then bashing it with something heavy like a rolling pin) and then sprinkle the crushed crouton and a pinch of crispy bacon bits onto the rocket. 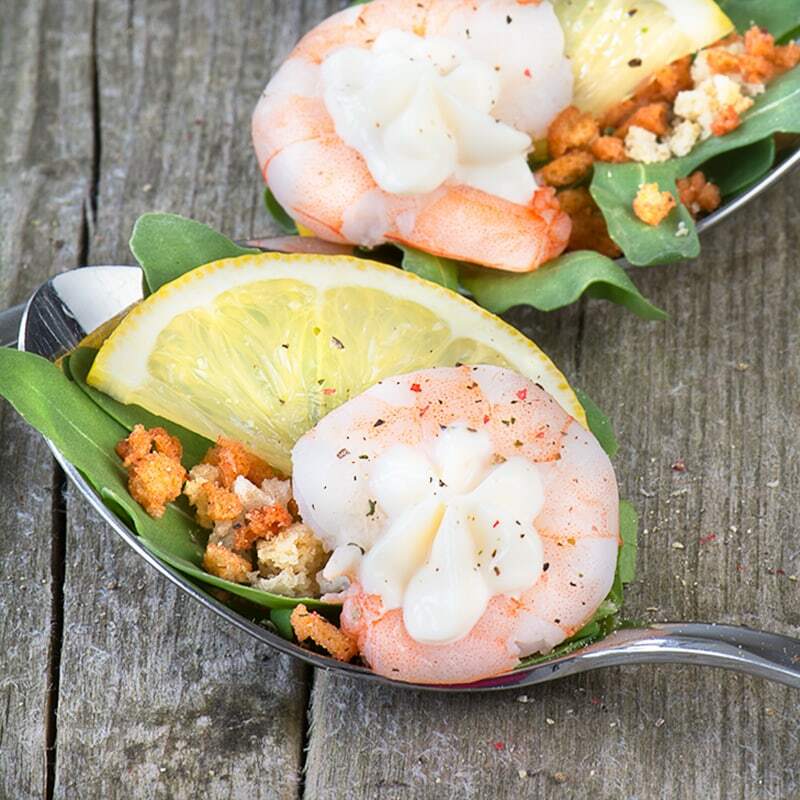 Lay the half slice of lemon onto the spoon and then place the prawn onto it. Add a squeeze of mayonnaise into the middle of the prawn (I put my mayo into a piping bag with a star nozzle attached to get it looking really pretty). Season with a twist of pepper. To eat simply slide the lemon out from under the prawn, squeeze it over the top and enjoy. I’m sharing this recipe with the following blog challenges… CookBlogShare with Hijacked by Twins, Recipe of the Week with A Mummy Too and Tasty Tuesdays with Honest Mum. Thanks Kirsty, they’d make a lovely lunch in the lovely hot weather we’ve had over the past few days. Sounds like you need to make the big bowl version then! Thanks Louise, the croutons add a lovely crunch.